The (unfortunately unsurprising) findings include that women and respondents with disabilities report significantly less positive experiences than men and respondents without disabilities “on nearly every measure of marginalization and professional devaluation” examined in the study, and that there is “a pattern of negative experiences” for LGBTQ individuals. On various measures there were significant differences found when comparing responses of white participants with those of Asian participants and with those of Black participants. There were also significant differences found between Hispanic/Latinx responses and non-Hispanic/Latinx white responses. All of these results were analyzed controlling for employment sector, education level, and age. In many ways, however, the survey responses paint a rather positive picture of mathematics as a profession. The researchers report that among the respondents, personal experiences of harassment are relatively low, and that across demographic groups, respondents generally feel that their work is respected by their colleagues and that their supervisors treat them with respect. Respondents on average believe their bosses give them the credit they deserve and that they do not have to work harder than others to be given the same professional recognition. 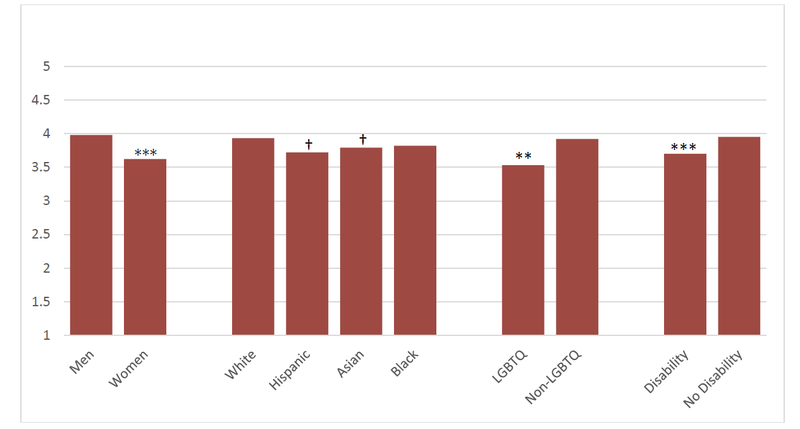 Few respondents reported high levels of LGBTQ bias in their workplace (though this could be due to the lack of visibility of LGBTQ status), and the majority of respondents did not observe instances of workplace unfairness toward persons with disabilities (though this could result from low numbers of visibly disabled coworkers). While these general trends suggest that members of the AMS tend to have positive experiences in their workplaces, this was certainly not universal and, as described above and detailed in the following, significant differences were found when comparing responses between different demographic categories. 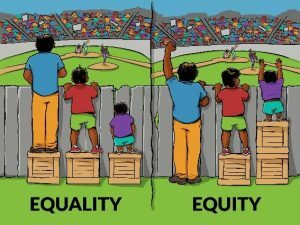 That said, the actual numbers in the workplace fairness section of the report should serve as a wake-up call to those of us who like to think that the inequities are few. 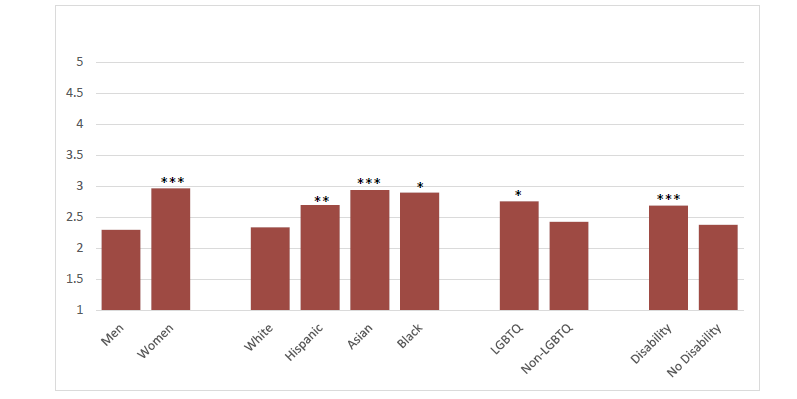 The researchers found high proportions of respondents across the different employment sectors “reported systematic biases in their workplaces and reported witnessing differential treatment in their organizations in the last three years.” Specifically, 27.5% of respondents reported that women in their workplaces must work harder than men to be viewed as competent and 17.9% of respondents believe the same for people from racial/ethnic minorities. Further, 27.3% of respondents overall reported personally witnessing individuals’ being treated differently due to their gender, and 14.4% of reported individuals’ being treated differently because of their racial/ethnic minority status. Fig 4: Proportion of respondents by sector who reported witnessing person(s) being treated differently due to gender in last three years. The responses from graduate students are even more striking. 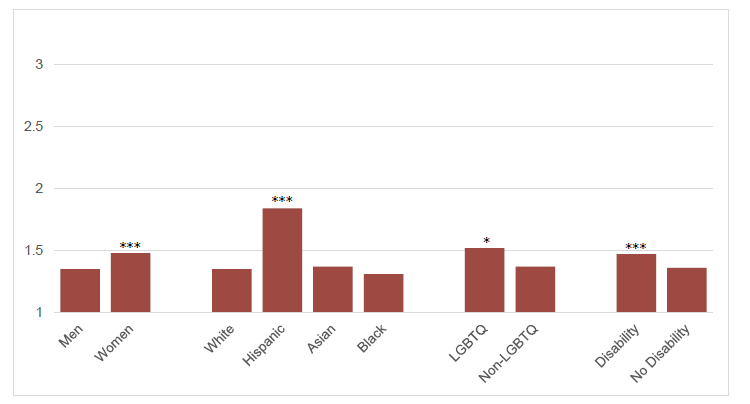 For example, 36.6% of graduate students reported witnessing individuals’ being treated differently due to gender in the last three years, 24.1% reported witnessing individuals’ being treated differently due to race or ethnicity, and the proportion of graduate students who reported witnessing individuals’ being treated differently due to LGBTQ status, though much smaller, was twice that of the non-student academic employees. At a request from the AMS Committee on Women in Mathematics, we asked the researchers to add some additional questions to the end of the survey given to the sample of AMS members. We learned that 29% of respondents have on-site childcare services at work and 63% are covered by a policy allowing parental leave. About 73% reported that they are aware of policies promoting diversity and inclusion at their place of work, and about 51% are at a workplace that offers training or mentoring in working effectively with a diversity of people. Personally, I am both encouraged and saddened by these results. As I wrote above, the overall results paint quite a positive picture, yet when looking at the disaggregated data, it is clear that mathematics has a long way to go. Each of us needs to remain vigilant in the workplace and to work to find ways of stopping inappropriate behavior by our friends and colleagues. We also need to look at ourselves to see if we are unwittingly contributing to the problem. Graduate programs need to acknowledge that inequitable treatment of students due to gender, race, ethnicity, or LGBTQ status is a problem and that they need to identify ways to address it. It is the responsibility of the department and institution to provide a safe, harassment-free environment for the students. I’d like to encourage departments with graduate students to do their own internal, anonymous surveys, preferably combined with some interviews, to obtain more details about their own situations. Most important, though, is the fact that we now have some data. It is far from perfect: some of the questions seemed poorly worded and the lack of the input from the individual interviews is frustrating. Although the data don’t paint a detailed picture, they do provide us with information beyond the anecdotal. This snapshot of the AMS members’ workplace experiences, though far from complete, is enlightening and useful. I want to thank all of the AMS members who took part in this study. I am looking forward to the researchers’ final report(s), drawing together the input from members of a wide range of STEM professional organizations. All too often, mathematics is left out of STEM-focused studies and programs. It’s good to know that members of both the AMS and the MAA (possibly along with other mathematics organizations) have made sure that mathematics is being well-represented in this national study. This entry was posted in introduction, STEM. Bookmark the permalink.